Welcome back Summer Virtual Book Club members! This summer 20+ kid bloggers have formed an online book club. Our book club is studying a different author each month. Read on to find out how you can join! We are linking up our ideas for the books which creates a great resource for an author study! So far we have featured Mo Willems and Audrey and Don Woods. This month, we are featuring books and activities by Kevin Henkes! You can view the June Summer Virtual Book Club for kids with over 50 Mo Willems themed book club activities here. You can also find the July Summer Virtual Book Club featuring books and activities by Audrey Wood here. Everyone is welcome to join the book club, even if you didn't participate last month. Just choose a book by the author of the month, do an activity, and come share it on one of the hosts' blogs on August 20. I'll have the linky right here at Ready. Set. Read 2 me for you to share ideas and read TONS of great ideas. The author for this month is Kevin Henkes. We love so many of his books and can't wait to see what everyone has to share. I hope to see you at the book club on August 20th. Let me know with a comment if you plan to join our virtual book club. Come back August 20th for the Kevin Henkes book activity blog hop. 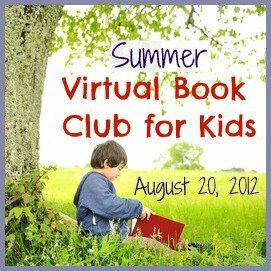 The Virtual Book Club for Kids will be continuing past the summer. Follow on facebook so you don't miss any of the great books and activities we'll be sharing.